As result of the recent visit of Naui Tec Team last June in Bonaire, the Brazilian Divemag magazine published a very special press release dedicated to tech dive in Bonaire. The 33 page article was published in the 45th edition of the magazine. The article featured Bonaire as the next tech dive destination for Brazilians. To read this article click here. The front cover of Divemag is dedicated to Bonaire. The article was also featured in Tiempo de Fondo in Argentina and Espacio Profundo in Mexico. We continue to extend our invitation to South America’s press to come to the island on a press visit. 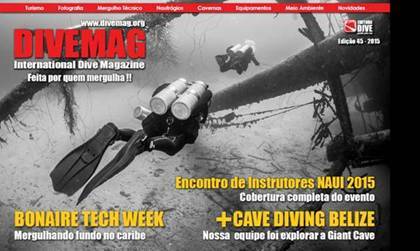 We invite you all to click http://divemag.org/wp-content/uploads/mag/divemag45w.pdf. Take a look at the front cover Divemag dedicated to Bonaire. A beautiful press release to be published as well in Tiempo de Fondo in Argentina and Espacio Profundo in Mexico. We continue extending invitation to our media pre ss -friends of Bonaire- to come to the island! !